When customers purchase our organic coffee beans for home brewing, the question most frequently asked is about how to make the best cup of coffee. Well, it’s a big question. Therefore, we’ve assembled 5 tips and steps for optimal brewing at home and for improving the flavour qualities of your organic coffee experience! The jury is still out on the best brewing technique for extracting that heavenly cuppa java. But, it’s safe to say that manual brewing methods provide more quality control of the process; hence, a more flavourful coffee. Still, there is great debate about the best manual method to extract coffee, ranging from pour-over/drip, press, vacuum, pressure to percolate. Not to mention there’s a plethora of simple to sleek brewer devices. But one thing is certain; the material on selecting the most suitable method and equipment is endless. Whether you’re a coffee connoisseur or a regular joe, the method will depend on individual taste and level of convenience. While we support all coffee brewing methods, our focus on this occasion is the popular French press method and its finer points for brewing at home, that is practical, convenient and straightforward! The French press (also known as a Cafetiere, coffee press, press pot or Melior) is widely considered the best method for brewing delicious coffee at home, especially with premium beans. The French press method extracts, arguably, more superior flavours than any other method. It is well suited for coffee drinkers that enjoy a luscious, expressive and complex taste experience. They are treated to rich, refined and robust but smooth flavours, with heavier body and stronger aroma. Pressed coffee also serves up more caffeine (praised for a range of health and nutritional benefits). And, just as important for people on-the-go, French press coffee is simple and fast to make/clean up! Because Trees Organic Coffee champions single origin organic beans, we think the purest coffee flavours can be drawn and kept through the French press. Master tasters think so too, as they claim the taste experience from a press method is closest to that from coffee cupping. French press coffee is basically unfiltered, unlike pour-over/drip techniques with paper filters. In a press pot, ground coffee is soaked, steeped and strained in hot water; therefore, coffee’s flavourful essential oils, caffeine and antioxidants are better diffused and preserved. Although the French press is an easy-to-use design, there’s more to making good coffee than adding ground beans, pouring hot water, waiting, and pressing. 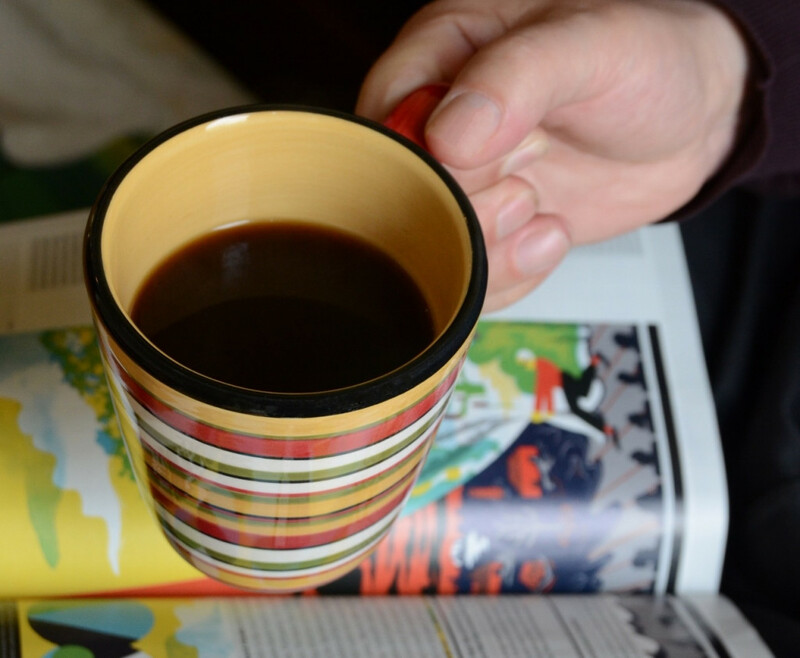 The other appeal of the French press is the ability to control the quality of a cup of coffee. Therefore, here are 5 simple tips and steps for brewing the tastiest hot coffee with your French Press. Use whole beans! Organic coffee taste better and is a healthier choice as organic beans are free of chemical pesticides and fertilizers. Try single origin beans to fully appreciate the true coffee profile of a particular country. Trees Organic has a range of organic, single origin coffees suited to any taste. Use fresh beans! To maintain the freshness of roasted coffee, buy small quantities regularly. For example, get enough for a week, or maybe two, at a time. The rule of thumb is that roasted coffee can go stale 15 days after roasting. Our goal is to provide freshly roasted coffee, which is why we roast our coffee beans in small batches daily. Store your whole coffee beans in a clean, opaque, air tight sealed container (eg. Airscape canister*). Place the container in a cool and dark area of your kitchen (eg pantry), not in the fridge/freezer. Grind your whole organic coffee beans just before brewing. A coarse grind (eg. size of breadcrumbs, sea salt or steel cut oats) is preferred for French Press coffee. 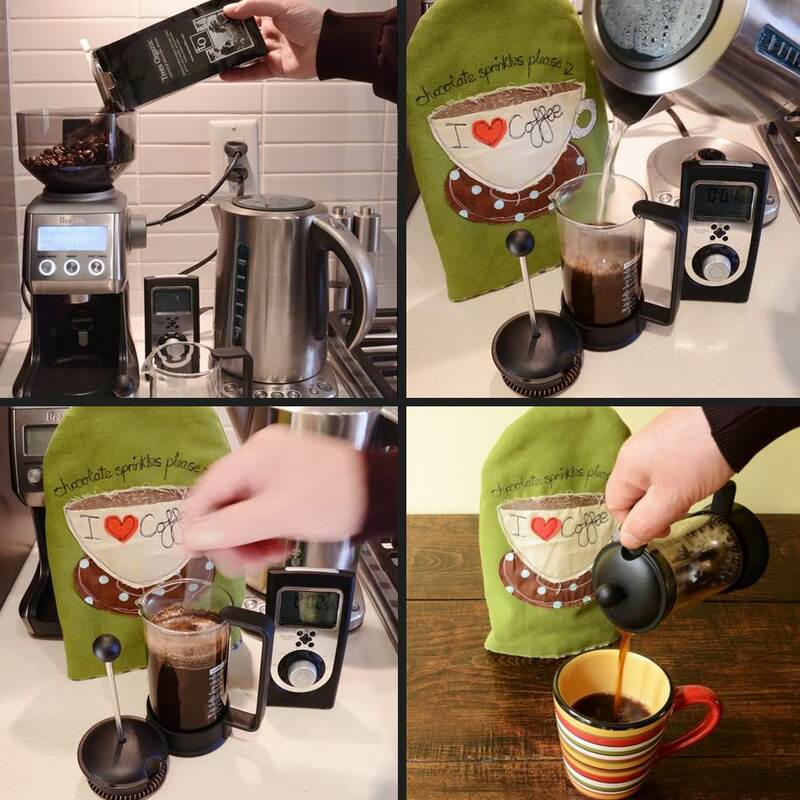 Use a burr grinder, or for more precision use a grinder with automatic settings (eg Breville Smart Grinder with pre-sets for French press and the number of cups*). When you buy a French press, examine the quality of the mesh or strainer (mostly stainless steel) on the bottom of the plunger. As the mesh is not as fine as a paper filter, a small amount of coffee fines or residue can settle on the bottom of the cup. Most people don’t mind the sediments on the bottom and leave the last sip in the cup; however, a better quality French press and mesh can minimize the amount deposited. For example, the stainless steel, double walled Bodum Columbia has a fine silicone mesh and seal on its plunger, reducing residue in a cup of coffee*. Add coarsely ground organic coffee to the bottom of your chosen French Press container. Warm up the empty French press with a hot water rinse before adding ground coffee. Hot water is needed to draw out the flavours of coffee beans, but it’s the temperature that allows the correct balance of extraction. Hot water for coffee brewing should be between 195 – 205F. Water boils at 212 F; hence, allow boiled water to sit off the heat for about 30 sec. before adding it to the coffee grounds, or consider using a thermometer to measure the temperature. Some electric kettles have variable temperature controls (eg. Breville IQ Kettle has a French Press 200F setting*). Pour just-off-boiled water onto the coffee grounds in the pre-warmed press pot, being sure all grounds are saturated (most of the grounds have floated to the top). Allow the coffee to ‘bloom’. Do not put the plunger lid on top. Filtered water is better, particularly if tap water has a strong chlorine smell and taste. #5 Steep It. Press It! Set up a time to count down from 4 minutes. Start it once the hot water is poured into the French press pot. After 1 minute, stir the water with coffee gently and thoroughly. Be careful using a metal spoon in a glass French press, or consider using a wooden spoon. Put the plunger with lid on top of the pot making sure the plunger is in the up position and mesh or strainer is above the water’s surface. Let it stand and wait. When the 4-minute timer is complete for this slow and gradual brew, press the plunger down gently while pushing the grounds to the bottom. Your delicious home brewed coffee is ready to serve! If you’re using a larger French press pot and drinking one cup at a time, consider pouring all the coffee into a thermal carafe to avoid a bitter taste due to over extraction in the French press. The above 5 tips and steps serve as a good starting point for improving your home brewed hot coffee when using the manual French press process. We recommend you test and adjust all the above variables to suit your palate. As the saying goes, ‘life is too short for bad coffee’, so enjoy brewing and sipping great organic coffee! Trees Organic whole coffee beans can be purchased at any of our five coffeehouse locations. *These devices are given as examples only and are not endorsed or sold by Trees Organic Coffee & Roasting House.